Plant-based proteins and supplements surge in popularity as more famous vegans and vegetarians step forward. 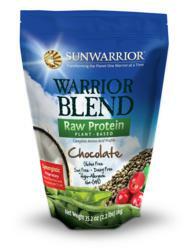 Sunwarrior's Warrior Blend enters Utah retails spaces. Dave’s Health is a great platform for our products. We hope to continue spreading our wonderful plant-based products into more health and fitness retail locations across the nation and the world. The changing face and popularization of veganism, as more actors, musicians, athletes, and business moguls declare themselves vegan or vegetarian, has paved the way for plant-based supplements to reach people of any lifestyle, not just vegans. Sunwarrior, a plant-based supplement company based in Southern Nevada, is pleased to announce their newest protein, Warrior Blend, is now available in Utah through Dave’s Health & Nutrition and their two Northern Utah retail locations. For more information about Sunwarrior visit http://www.sunwarrior.com. For more information about Dave’s Health & Nutrition visit http://www.daveshealth.com.